A warm welcome to friends, yogis and my students and newcomers. 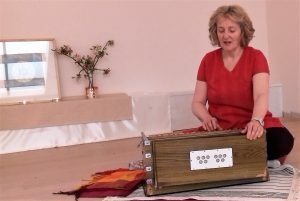 Thirty minutes’ meditation is followed by up to 30 minutes of mantra chanting and/or kirtan and arati, and then sitting in that vibration. This is free, including hearty vegan soup and gentle conversation if wanted. Great if you can bring your own cushion and blanket (some supplied) for sitting on the floor. It is also nice to have a shawl during meditation. Flowers and fruit for the altar are welcome. Vases and bowls ready for you to put them in. Please RSVP and study the directions on the contact page. Car sharing is encouraged so let me know if you can offer or need a lift. You might want to read more here, what is bhakti yoga? and here, chanting and here, meditation.